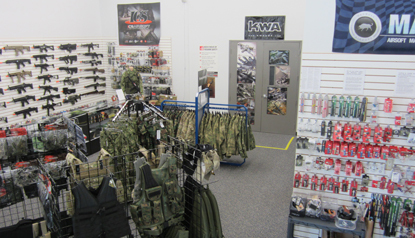 Minnesota's premier airsoft retailer! Our retail store gives you our low online prices combined with the convenience of visiting our shop in the Twin Cities. Our knowledgeable and friendly staff will help you find exactly what you're looking for. 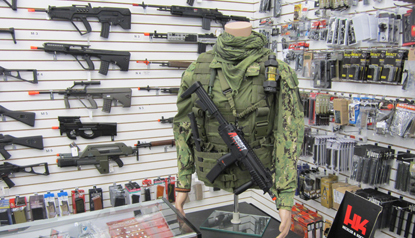 We have hundreds of airsoft guns on display as well as a large selection of tactical gear, protective gear, BBs, Green Gas, and many other accessories. Please note that some of the items available online are not available in the store. The prices in the store are the same as the prices advertised on the website. Whether you're looking for your first airsoft gun or are an experienced player we've got you covered! Repair and Upgrade Service: We offer diagnostics, repairs, and upgrades of all AEGs at a reasonable cost. Our skilled technicians will make sure that your parts are installed correctly and that your AEG is working flawlessly. We do everything from high speed builds to high FPS upgrades. We also do external upgrades and other custom builds. Stop by today to see what we can do for you! Please note that all airsoft guns brought into our store must be in a gun bag or box. Directions: Our store is located just north of I-94 and I-694. Use the interactive map below to get directions.